Wikinomics – Will universities stay relevant? Last week I wrote a substantial essay for the Edge arguing that the universities are entering a period of crisis. I argued that is a widening gap between the model of learning offered by many big universities and the natural way that young people who have grown up digital best learn. The reaction on Twitter, mainly from students has been enormously positive. So far two academics have written critiques of my views at the Edge. However because the Edge does not enable readers to comment, I’d like to know what you think. Please read a summary below and then check out the Edge article and let the world know what you think here on Wikinomics.com. The old-style lecture, with the professor standing at the podium in front of a large group of students, is still common. It’s part of a model that is teacher-focused, one-way, one-size-fits-all and the student is isolated in the learning process. Yet the students, who have grown up in an interactive digital world, learn differently. Schooled on Google and Wikipedia, they want to inquire, not rely on the professor for a detailed roadmap. They want an animated conversation, not a lecture. They want an interactive education. Students are making new demands of universities, and if the universities are to remain relevant, they will have to change. Professors will have to abandon the traditional lecture, and start listening and conversing with the students — shifting from a broadcast style and adopting an interactive one. They should be encouraging students to discover for themselves, and learn a process of discovery and critical thinking instead of just memorizing the professor’s store of information. They need to encourage students to collaborate among themselves and with others outside the university. Finally, they need to tailor the style of education to their students’ individual learning styles. This is not fundamentally about technology per se. Rather it represents a change in the relationship between students and teachers in the learning process. In the old model, teachers taught and students were expected to absorb vast quantities of content. Education was about absorbing content and being able to recall it on exams. You graduated and you were set for life – just “keeping” up in your chosen field. Today when you graduate you’re set for say, 15 minutes. If you took a technical course half of what you learned in the first year may be obsolete by the 4th year. What counts is your capacity to learn lifelong, to think, research, find information, analyze, synthesize, contextualize, critically evaluate it; to apply research to solving problems; to collaborate and communicate. “The time has come for some far reaching changes to the university, our model of pedagogy, how we operate, and our relationship to the rest of the world,” says Luis M. Proenza, president of the University of Akron. He asks a provocative question: Why should a university student be restricted to learning from the professors at the university he or she is attending? True, students can obviously learn from intellectuals around the world through books, or via the Internet. Yet in a digital world, why shouldn’t a student be able to take a course from a professor at another university? Proenza thinks universities should use the Internet to create a global centre of excellence. In other words, choose the best courses you have and link them with the best at a handful of universities around the world to create an unquestionably best-in-class program for students. Students would get to learn from the world’s greatest minds in their area of interest – either in the physical classroom, or online. This global academy would be also be open to anyone online. 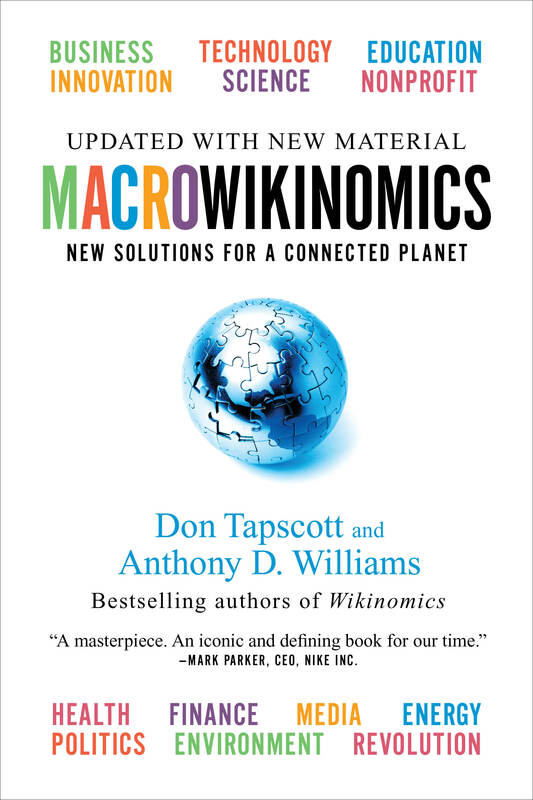 This is a beautiful example of the collaboration I described in the book I co-authored, Wikinomics. The digital world, which has trained young minds to inquire and collaborate, is challenging not only the lecture-driven teaching traditions of the university, but also the very notion of a walled-in institution that excludes large numbers of people. Why not allow a brilliant grade 9 student to take first-year math, without abandoning the social life of his high school? Why not deploy the interactive power of the internet to transform the university into a place of life-long learning? This is rubbish mate. Hardly any Professors teach rote learning anymore. You’re out of date. a. they did not grow up in this time period, so to say that they understand this new way of thinking is almost laughable – I agree that they can see what happened, but how can you truly understand growing up with something like the internet? To them books are still king; the reliability trumps the fact that they are often enough useless the minute they are published. This is an age of information, and of immediate, constant information access. The comments about kids pounding their phones tweeting just shows that they don’t understand. This is not a new layer on an old system, this is a new way of living, and a new way of learning. b. they are the ones still using the old ways of learning, and are in fact enmeshed in the system. To begin with, it is hard to look at your own methods and find fault – if you had found fault, you would have already corrected for it – but that doesn’t mean it’s not there. One of the largest issues I find with professors in general is that they are the ones teaching! That is to say, they were the ones that did well and enjoyed academia in the first place. They flourished under conventional methods of education so much that they stayed to make it a career! There is an essential flaw here, and that is that professors cannot see that their methods do not work for students because those same methods Did work for them when they were being educated. Talking about integrating clickers and such technology is great, don’t get me wrong, but those are steps that were taken over a decade ago. At my University they have clicker setups in every classroom – which means this is hardly a new method, as we know deployment like that takes a fair amount of time and resources. These things are amazing tools, just as books, and projectors, and simulators are all amazing tools. The problem is that what we are talking about is an essential flaw with the groundwork of our education system, not just flaws with some of the components. Things like integrating clickers and tutorials were effective stopgaps, but they don’t fix the problem. We have a whole generation of students who the professors largely don’t understand. This is through no fault of their own, but it is true nonetheless. Information changes constantly, and just as I knew that Pluto was a planet a few years ago, I now know that it isn’t. Information is no longer hard in the same way that it was portrayed to be for our parents. It is ever changing, and we as a generation understand that. We know that our view of the world changes constantly, and it’s less important to know as much “hard” information about it, and more important to know how to learn and adjust as time passes. Education is no longer in the television generation; it is no longer about broadcasting information. We are now in the internet generation, and interacting with information is key. To be frank, I don’t quite follow any of these arguments. It has the reasoning of a five year old arguing that water is blue, not clear -pretty tedious. Any educator will tell you that teaching is not unidirectional anymore. Sure, the internet and other multi-media devices make great tools, but they make a poor replacement for face-to-face learning. Case teaching is an example. Its much more efficient to have class discussions in person than online. Why do you think millions of students continue to enroll in physical universities instead of do the courses online? Look, you obviously come up with some pretty thoughtful ideas that appeal to the masses. But for academics they sometimes come across as a bit fluffy. You need to start using more evidence in your claims, otherwise, they are just that, claims. By the way, to that other guy: I was an Postgrad in 2007. I’m not THAT long out of university. The best professor/teachers have been interactive and multimodal long before technology enabled students’ greater access to information (and each other). Part of the crisis–if there is one at all–is in more traditional lecturers having the confidence to admit that they do not possess all the information available in their area of expertise. I understand your point, but I think “crisis” overstates the issue. I work for The Open University in the UK. It’s the largest distance education institution in the world and has been at the forefront of innovation in education for the last 40 years. We’re constantly looking to address the needs of the next generation learner and sometimes we have to park our research into new methods and technologies for a few years before we find our students are ready for them! At the moment we’re developing an open platform for learning based on the potential for the social web to move educational practices forward. It’s the case that the learner has always had to adapt to the educational system – sometimes that approach works, sometimes it doesn’t. The SocialLearn project will provide a different approach, putting the learner in greater control of what they learn, when and with whom and yet providing the structure and support that learners want. I’d encourage anyone interested in this subject to sign-up for the private beta at: http://www.open.ac.uk/sociallearn. I agree that the cost of teaching should be going down as the technological tools for information presentation, storage and delivery become more advanced. There was a day (not long ago in the scheme of things) where the only music you could have was live music. Having music implied either being a musician or paying a musician. Then along came recorded music and the electronics revolution and suddenly the delivery of music is much cheaper and down comes the cost (and a lot of musicians out of jobs). A lecture on integral calculus (once pre-recorded) is relevant pretty much forever, so logic dictates that there should only be one such lecture. Given a competitive market there might actually be several such lectures but eventually the free one will win and it will be downloadable from archive.org and after that, why would anyone ever ever give another lecture on integral calculus? Lectures on object oriented programming, document markup language, and trend analysis for market stocks, are much more likely to change with the fashion of the day. Keeping up with the latest techniques in these fields is very important so people will want a ready reference of material that is constantly kept up to date. Universities provide this service, but then again, so does Wikipedia, and so does google if you know how to drive it. Who does a better job? That’s a matter of opinion, they all have their weaknesses. Why do lots of students enroll in University? In my experience, mostly they do it to keep their parents happy, and they don’t have much idea what else to do, so they go with what seems to be a well understood option. No small part of the university experience is status and reputation (i.e. pure unadulterated prejudice). Saying “I read Wikipedia a lot” just does not deliver comparable impact to “masters degree from Cambridge”. Maybe someday it will… don’t expect that to happen real soon. Every new generation is put into a position of asking the older generation for a job, so they need to pander to the preconceived ideas of their elders. Universities will not die, they are too useful given the collaborative nature of human learning: they bring many different people together for the purpose of learning (and perhaps doing research). This is essential, not just for professional learning, but for life-learning (learning from other’s experience so you don’t have to experience it). Sure, people can learn by consulting google or wikipedia, but it’s not nearly as good as face-to-face lectures (where you can ask questions!) or office hours, because the teacher there has some idea what is going on in the student’s mind as he/she learns, and can anticipate questions and give relevant guidance based on experience. Google and Wikipedia, for now, cannot do this as well as a good, thoughtful teacher or friend. I think that the problem is that the idead is over-enthusiastically promoted. The younger generation may collaborate more but that is not a blanket staement. We risk moving from one orthodoxy to another – thou shall collaborate or else. Not all of them are the same, different parts of the world are different, so please no one size fits all arguments. Young people are also not particular critical about what they find on the internet. The ability to analyse, to critically thinking is best done face-to-face. Too high a focus on online and all you get is a different kind of rote-learning. Groupthink in collaborative settings. I am doing a long-distance Master’s and I can tell you I am glad for the few times, we get together physically to discuss, to exchange physically. That is the oldest form of collaboration, it too has value. To the extent that universities are knowledge factories, churning out research and novel contributions to the sum of human knowledge on the one hand, and skilled workers who can perpetuate the academic model on the other, I think one question we might ask is whether universities should be a “mass market” enterprise anyway and what, exactly, they are trying to accomplish? Whilst pondering this question, (maybe placing it in a historical context – what were the original institutions were established to do? – as well as a more contemporary context – what do funding agencies and students expect a university education to provide? ), it’s probably also worth bearing in mind that whereas the Academy was once the go to place for specialist knowledge and advanced critical thinking skills, that is no longer true. As academics, we no longer have *privileged* access to big ideas – Google has seen to that! One thing that I have come to appreciate recently is the extent to which many of the people I respect most in the part of academia that I inhabit (educational technology) are expert learners themselves: they make use of their knowledge and skills in a public way to come to a new understanding of how to use and get the most from new technologies. So I wonder to what extent our role as teachers might actually be redefined in terms of learning through other peoples’ eyes. That is, we use our learning skills to put ourselves in the position of our students and learn about a subject through their eyes whilst demonstrating our learning skills to them. Rather than standing at the front of the class looking at the students, maybe we should be sat with them looking at the same problem from the same perspective. Whilst I had a mindmap of topics I thought I wanted to explore at the start, the actual uncourse followed an open ended path. Each week, I would write three or four posts, but the actual content of each post was influenced by what I had written in previous posts, what comments had been made on those previous posts, what I had recently learned, and from time to time, what was currently in the news. Whilst researching each post, I also found myself commenting on other peoples’ blogs, both to question them (and explore my own understanding, but also to teach on something I had maybe just learned. (On occasion, this also meant I could link back to something I had written on the uncourse blog). The ‘uncourse’ nature of the blog was further demonstrated by the emergence of different pathways through the content. As well as category tags (which gave rise to topic specific mini-courses based on all posts categorised in a particular way), paths between topics also arose from crosslinks between one post and another in a bidrectional way: whenever I linked to one post from another, a trackback link would appear on the second post back to the first. Although the uncourse was not formally accredited, I hav since linked to some of the content published there from a real, for credit undergraduate course. By setting assessments where students must address a particular topic, maybe using resources they have found for themselves, we as educators need to lose our far of losing control and look for ways where we can credit students for finding their own solutions to problems, as well as adding those solutions to our own repertoire and maybe showing them to future students. In turn, this means that as educators we need to start admitting to ourselves and our students that we maybe don’t know all the answers, BUT we’re pretty darned good at being able to work them out. Great Post and Follow-on Discussion! I think Marc D. Hauser and James O’Donnell’s responses on the Edge forum represent a disturbingly out-of-touch perspective, particularly O’Donnell’s. Hauser seems just a bit short-sighted, behind the curve so to speak, but O’Donnell comes across as downright arrogant, resentful, and closed-minded. It is slightly ridiculous for O’Donnell to have accused Mr. Tapscott of being out-of-touch when he seems so adamantly resistant to the real merits and potential of techno-cultural practice in learning in our time. The tone/subtext of this statement alone: ["Oh, I give you the NetGen kids pounding their phones to tweet each other and the hyper-multitasking and the creativity that arises in such settings."] demonstrates at best a dismissal of the cultural reality of his learners and at worst a borderline contempt. It is disappointing to think that this attitude is representative of the pedagogic climate in our higher institutions. It is defensive and painfully lacking in critical reflection and any embrace of forward-thinking approaches to teaching and learning. But what of cultural relevance – demonstrating, nurturing, and advancing a _value_ for learning in its highest forms? It would seem that in this regard the question of the relevance of Universities has (at least in part) to do with how they choose to leverage the profound vehicles of information accessibility and exchange that new technologies and a ubiquitous (wireless) internet represent. It’s literally in the air around us, and we’re more or less all plugged into it, increasingly so. What can Universities bring to (and take from) this pot luck? I’d suggest that they must do more than embrace technologies such as smart-boards and clickers, they must do as Professor Lewin and his collegues at MIT (and elsewhere that offer open courseware, such as Berkeley, Johns Hopkins, etc*) have done and be active participants in the democratization of higher learning, using internet and collaborative technologies as vehicles for authentic information exchange and knowledge transference – even if it means challenging a traditional, proprietary configuration in favor of a more collective one. They must investigate and hone new models of pedagogic inclusion, across real- and virtual- space/time, negotiating the uncertain territories of collaborative media and open-source knowledge assets, and be the true incubators of breakthrough thinking and innovative problem-solving in our increasingly messy global techno-culture. This can’t happen exclusively from atop and within an ossifying iv(o)y (league) tower no matter how stubborn its inhabitants are to wish it so. And by the way, we would do best to begin thinking through credentialing questions now, as challenges to this old world order will be next to come from an increasingly self-educated populace. It’s an exciting time. I’m sorry Mr. O’Donnell has to miss it. *As Mr. Tapscott’s post discusses, these sorts of initiatives popping up in many Universities speak very much to Luis Proenza’s vision of a kind of global University if properly nurtured. Not unthinkable! Tony Hirst (and collegue Laura), your posts are much appreciated and I am eager to learn more about The Open University. Clearly (imho) you all are on the right track, with not only your answers, but more importantly, with your questions. **Assessment’s role (and the industry that seeks to define and deliver it) in all of this is certainly a can of worms for another day, at least for this commenter! Good post Don. I only think that the title is just one of the titles that could fit this post, and that this title isn’t the best you could choose. - Universities in the Netherlands are constantly looking for new ways of organizing knowledge transfer from professor tot student (and vice versa). Of course there are some dinosars that find this difficult but overall the trend is constant modernization of teaching. - It is the schoolsystem before university that needs to change more. This schoolsystem is exactly the same as it was 100 years ago. Children from 6 to 17 are treated the way you describe in your post. Shut up! Be quiet. Listen. You know nothing. I know it all. That is the adagium during these years. - Another discussion point is that you are talking about students as if every student is the same. Well they are not. Some of them need strict rules and need to be taken by the hand to learn while on the other side of the spectrum some are able to do it all by themselves. A schoolsystem should always be flexible enough to handle all kinds of students. We need to agree before we can disagree. Huh? Okay i’ll rephrase that. Interaction requires a shared knowledge base. Any discussion will find its offspring in some kind of consistent world view combined with specific knowledge of an issue. In the teacher student relation there often is a huge gap in knowledge. A student will be able to gather information using Google and Wikipedia but will not necessarily be able to put this information into a wider framework. Lacking this framework they most likely will also miss a lot of relevant information while performing their search since this broader view provides useful keywords. In my experience as a teacher i can always find at least one relevant piece of information that my students missed by using the right keywords and search strategy, and a lack in information is a serious handicap in any conversation. Not really a discussion there. It’s more like providing a link to a specific web location which is useful for one specific student working on a project. It’s giving a guidance to students for finding relevant information based on years of experience (yes, this professor was an old man). I’d say its something like narrowcasting: Provide useful in-depth information for a niche group. The example of the professor opening a book, showing a page and walking away took roughly 5 minutes. There was no discussion on weather it would be relevant or not, it was completely up to the student to find out. It did give students an opening into the framework of knowledge the professor was carrying around. Carrying literally, the suitcase was extremely heavy. A link on the internet may improve the physical state of the professor but i somehow liked the small ritual of the opening of the suitcase and the book as a solid source of information. I’m not sure but it feels like a professor spelling out a deep link to a web location seems to be wrong. In this form the teacher should be able to talk to quite a lot of students, finding a relevant link wont take any time since he is just sharing associations. Just think of the time a discussion without any research in a library (yes I’m that old) would have taken. I’d say a useful and productive discussion cannot be done in less then 20 minutes. It would effectively downscale the action-radius of this specific professor 400% and it would also take away the opportunity for students to research the value of a source by themselves. Opportunity to research? Well to be really honest with you all while i was attending my academy sometimes i did research, but many times i did not. Why? Was I more lazy then other students? Or was I not interested? The truth is I was too interested, but not in the study necessarily. Attending a university is not just about learning to do some job, its an exiting phase of your life in which you learn many things without any professional relevance. Like what opening line the girls will react to. You may find out if beer tastes better then wine or make friends you will see for the rest of your life. Don’t underestimate the value of the social side of attending a university. Most people meet their partner during their study and marriages between people that meet later are significantly less stable. Is a student that is focussing more on the social part of following education per se a weak student? Are the students who seem to present a weak product in an inspiring way weak students? Our future seems to be designed by people who can present an idea much more then by people with a theoretical background. I could ask myself if i would take the same effort in writing this if the original article was posted on some obscure specialist blog. But hey it’s the Don! I guess there’s different flavors in cool in life. So what makes a good teacher? Looking at my colleagues and the way students rate them there is an interesting twist. There’s the young group of new lecturers who all try to incorporate new forms of education in their programs. Opposite to us (yes, now I’m young again) there’s the dinosaurs with the ultra conservative views on education. Students don’t seem to care much about the form of a course, they are really clear on what they want. They want to be educated by people they respect for their knowledge of the their field of expertise. The most effective way of teaching is giving original views on actual cases. An extremely effective way of presenting actual cases is… a lecture! Or to put it in more 2.0 like language, in the university setting content is king. I hope we all agree we don’t want our university’s to build up some kind of cult of the amateur. Inspiring lecturers, real life examples an in-depth information (preferably information not publicly available) can spice up a college. But what is the position of a course in a program? Offering single courses is great for students that want to explore an area besides their study but it can never replace a complete program. A program should offer more then a collection of individual courses, there should be extra value in the way information between courses is linked. Think of an exhibition in a museum where the art of Picasso is not only shown but also compared to other artists and is put n a cultural historic perspective. Does the audience just enjoy the Guernica as a painting or does it get a better understanding of the relevance of art as a mirror of human nature? Presenting a complex story requires insight in different views and approaches, from different specialization’s. That defines our role as lecturers; we should look beyond our area of expertise and try to find a way to encourage discussions without the need to actively participate in all of those discussions. At the Institute of communication we have a program where we are practicing this. We all start our classes with the following statement: all of our colleagues are not only wrong, they are complete idiots and should not be listened to in any case. Finding out why we are wrong seems to really awake our students. And not only our students, it’s a form of behavior we all can recognize in ourselves. Don Tapscott: I will read your essays cause i think you’re wrong. I could say – hey kids leave the teachers alone! As a professor in Brasil I have experienced the resistance from undergraduate students on co-creating the class.I fell they expect you – as the owner of all knowledge in the world – to tell them about everything. I would like read other teachers experiences on how they bring students imagination and creativity into the learning process at the university. Quick response to your article from k-12 angle- there needs to change, significant change, in regards to instructional practice. We also need to shift the focus from being dominated by content acquisition to more heavily based on skill acquisition. So I agree with your article but I recently came across this video from Dr. Daniel Willingham at the University of Virginia related to learning styles and their misapplication of the this theory related to classroom practice. It speaks “Finally, they need to tailor the style of education to their students’ individual learning styles.” I am not so sure that it needs to be individually tailored but instead perhaps the goal needs to be to make the learning experience as rich as possible which would require using multiple learning styles. Online learning? Yes. Learning on one’s own? No! I don’t think universities are on the endangered species list quite yet – but I DO think that they have a lot of catching up and changing to do if they want to stay relevant. Unfortunately, many don’t seem to care too much about relevance, especially in the humanities. As an academic I find these vast generalisations such as you have made in your article quite tiresome. How many more times do I have to listen to consultants telling me how ‘out of touch’ I am? Is there any recognition of the fact that so many of the popular discussions of these issues lack any depth. I teach in a British University and interactivity is encouraged. During my two year period of training as a teacher in higher education I was encouraged to facilitate different learning styles. Although I conduct ‘traditional lectures’ rather than podcasting myself while sitting on a beach drinking cocktails, my lectures are about collective learning not rote learning. University is a place where people can think, debate and challenge their ideas. Although skill acquisition is important, so is developing the ability to think, to understand why you have formed the judgments that you have and so on. Many of the ‘tools for learning’ that have been developed come from a recognition by educators that such interactivity can be facilitated. I have no problem using new tools and techniques and often my students have never heard of them or used them before my class. But these, as other posters have noted, facilitate learning rather than replacing other forms of learning. I would never write a book or paper about a sector without doing extensive fieldwork in that sector and hope that you will possibly do some research into contemporary learning and teaching philosophy and practice. And, for the misguided contributor, wikipedia is no substitute for University, much of the information is the pooling of ignorance rather than knowledge.